Last Sunday, as I pared through these plums, sweet, pink yet barely-colored juices dribbled down my hands, under my nails, and all over my cutting board. But to my eyes, they were bloody red and left stains. I swore. I slashed harder, ripping through the smooth but relentlessly taut skin and piercing the just-ripe flesh, with vigor, down to the core. I cursed it. I took out every ounce of anger I had on that natural, living object. I’ve been feeling off. The preceding Sunday, I had delicious plans for six black beauties that I had ripening away on the counter. My vision for them combined a recipe over which I have been lusting for a couple of years with two pastries I had eaten at two local bakeries. 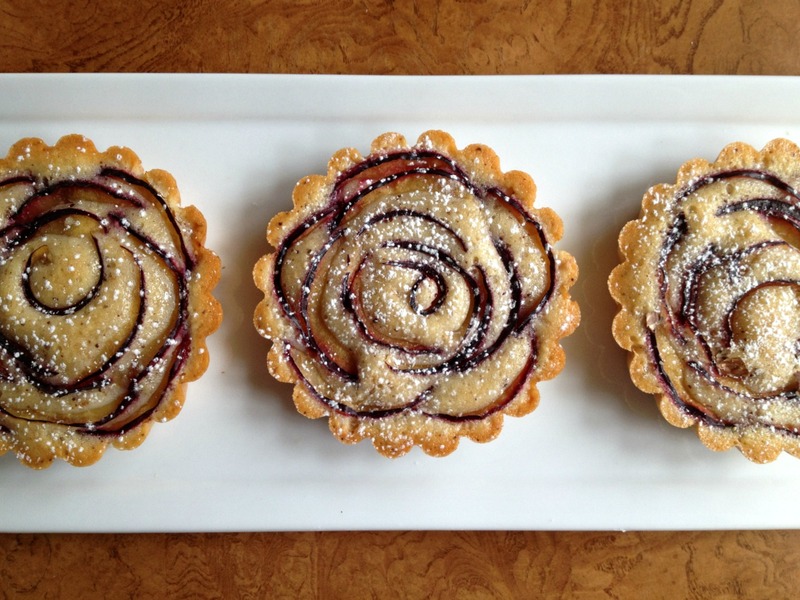 A trifecta of pastry perfection, you could say. I got caught up. I forgot. And then it would be too late. I forgot? There would be no plums that day. I proceeded to test a cookie recipe that will be the base of a dessert to come — if it ever gets done. I’ve been working on it once a week for many. It’s never good enough. I sat down. I forgot. They burned; the smell of blazing butter and overly-nutty wheat alerting me that I hadn’t set a timer. I hurled the smoldering saucers in the trash, losing all of that perfectly good, simple ingredient to my own carelessness. I forgot? This was poison for a perfectionist. I looked back at the sad, neglected plums. I’d be resourceful. 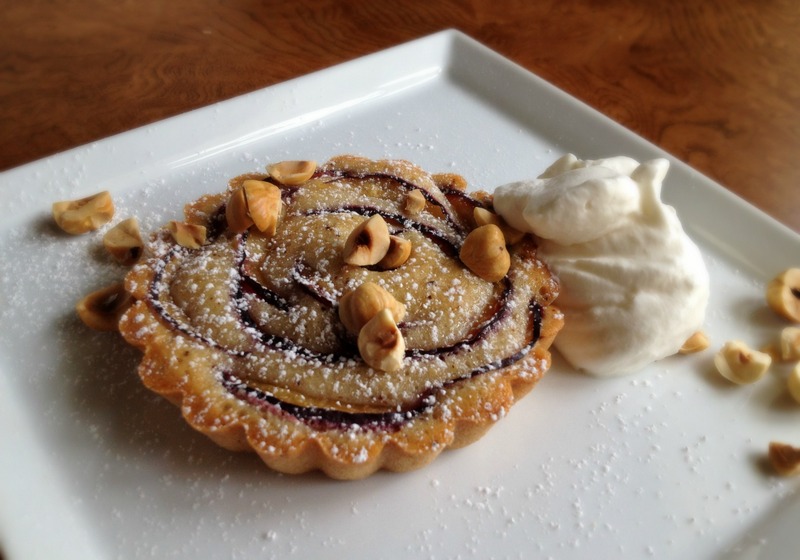 I’d roast those plums and dollop ’em with brandied whipped cream. I’d poach ’em in brandy. (Are you sensing a theme here?) I’d make a breakfast cake from Dorie Greenspan, scented with orange and cardamom. I’d make a crisp, a crumble, something. But, no. I ate one whole. A real glutton for punishment, apparently, I had another, then another. I didn’t taste those three plums. I didn’t enjoy their floral sweetness or their rounded tang; I ate them to rid of them. And after those three, when my belly was about to bust and I couldn’t eat any more, I hid the remaining plums in a paper bag, even though they needed no further ripening. I’d no longer have to stare at those wretched creatures on the counter as they ripened, wrinkled, burst. My mind has been elsewhere. Food — my literal and figurative lifeline — has come second. I’ve suffered. I’m lucky enough to work with it everyday, but I’ve been detached from the active side. My hands have not been dirty enough. Flour hasn’t made its way past my fingertips to my arms or my face or my nose, as it so often does when I’m baking. Really baking. Carelessly parceling together lunches for myself at 9:30 pm the evening before work, my vinaigrettes have been off kilter. Olive oil drenched and sea salt-flecked tomatoes while standing up, or worse, while walking or running, have counted as meals. Dropping fruit on the train floor has become a weekly activity; thick yogurt and a spoon becoming my only breakfast companions. I’ve always appreciated simple food, but things have been too simple. Not nearly seasonal enough (save for those tomatoes), and it’s killing me everyday I write the date at the top of my to-do list. It’s August. Well, I finally stopped this past Sunday. I took a deep breath. I told myself not to forget. And I made what I had intended to make all along. Financiers! With Plums! 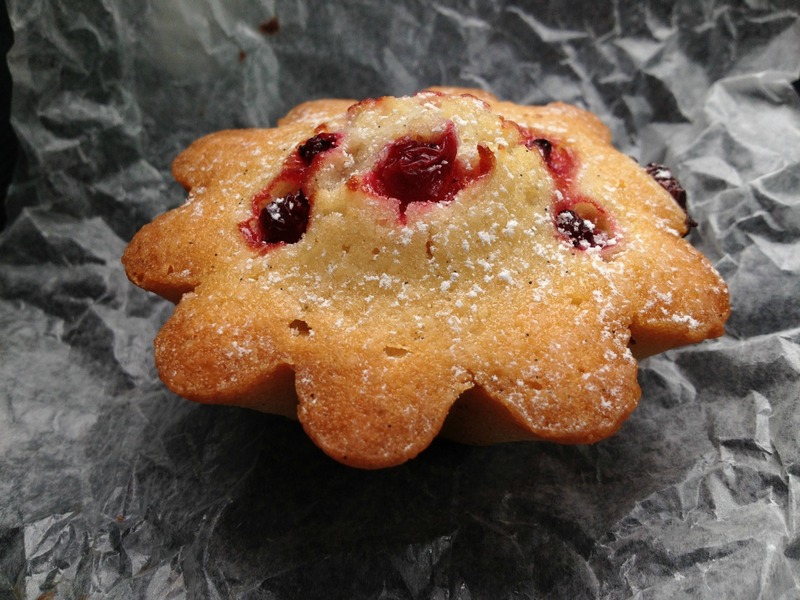 It’s no secret (or at least now, anyway) that I adore financiers. Nuts and browned butter: these are a few of my favorite things. And a little cake that, within the first couple of hours after baking, is crisp on the outside with a moist, and dense crumb? Yeah. I’ve made the very traditional version many times: little buttons with ground almonds like the ones I had at Bouchon Bakery. Sometimes I’d drop some blueberries on top or some toasted nuts. But that’s about it. 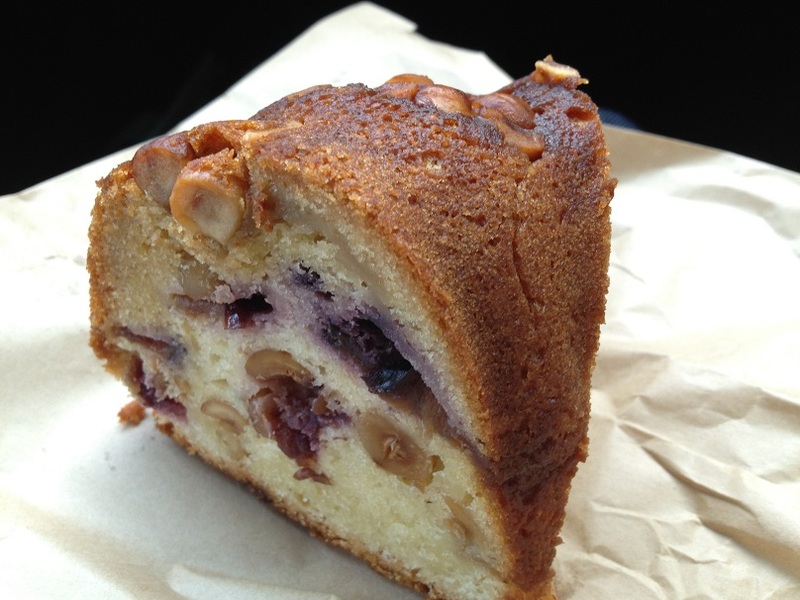 A few years ago, I discovered the financiers at Clear Flour Bread (Brookline, MA). They’re relatively simple, too, but they’re large, more plush. They’re made in petite brioche molds. This year, more than any other year, they are liberally flecked with vanilla beans. They’re topped with rotating berries, but I have a penchant for the very traditional currant adornment; the tart, fruity bite complements the rich base. That was inspiration #1. Inspiration #2 was this hefty slice of Plum Bundt Cake I got on a whim on my way out of Tatte Fine Cookies and Cakes (Brookline & Cambridge). It was humble-looking but sitting so pretty on a covered glass cake stand. And it turned out to be the most sophisticated Bundt I have ever had. The plums were soaked in brandy, and they perfumed the dense, intensely buttery base cake. And there were hazelnuts, which pair naturally with plums. They were caramelized and added pops of crunchy sweetness to each balanced bite. These two treats immediately reminded me of Rose Levy Beranbaum’s Plum Round Ingots. So I changed the base nut to hazelnuts (and the recipe, because I make financiers quite differently) and got these beautiful plum roses. All of that anger, unleashed on the poor little plums, resulted in a beautiful final product. I think I enjoyed looking at them just as much as I enjoyed eating them. And that’s a lot, because they were so rich — almost fall or winter-like in their deep nut flavor — but punctuated and brightened by the paper-thin, delicate slivers of plums whose petals slash through the cakes. With a cup of tea, they’re a cure-all, even for a damaged perfectionist. I forgave myself. serve with brandy whipped cream! Adapted (liberally) from Rose Levy Beranbaum’s Plum Round Ingots. For the original recipe, see Rose’s Heavenly Cakes. Do not do what I did. Remember to make the batter in advance. The original recipe actually called for a 6-hour resting period, but I prefer overnight. If you’ve never had a financier before, you may want to refer to the original recipe, as it uses almonds, which is traditional. But plums and hazelnuts adore each other, so I abandoned my favorite nut in this instance. After the overnight rest, the batter will thicken considerably and the flavors will come together. I strongly suggest using weight measures, not volume. Financier magic usually only happens when things are done precisely. Preheat oven to 350 degrees F. Spread nuts on a baking sheet and roast for 8-10 minutes until golden and fragrant. Remove from oven and let cool. Grind toasted hazelnuts in food processor until fine. In medium bowl, combine ground hazelnuts, flour, sugar, and salt; whisk to combine. In small saucepan, melt butter over medium heat. Once melted, cook, stirring frequently, until milk solids turn deep brown and butter smells of (coincidentally) hazelnuts. Remove pan from heat and weigh out 73 grams (6 tbsp) into liquid pourer measure. Save remaining butter for another use. * Whisk egg whites gradually into flour mixture, just until incorporated. Whisking all the while, pour measured butter (making sure butter is still hot) into batter. Do not overmix. Once combined, wrap bowl with plastic wrap or transfer batter to an airtight container and store in refrigerator until ready to bake. Grease six 4-inch fluted tart molds. ** Spoon 60 grams (or 1/4 cup) of batter into each mold. 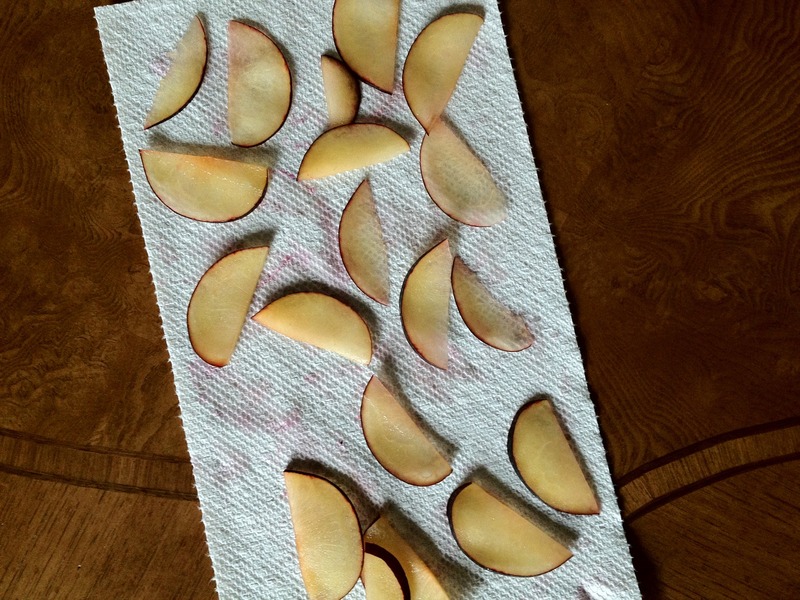 Using a sharp paring knife, cut plums in half and remove kernels. 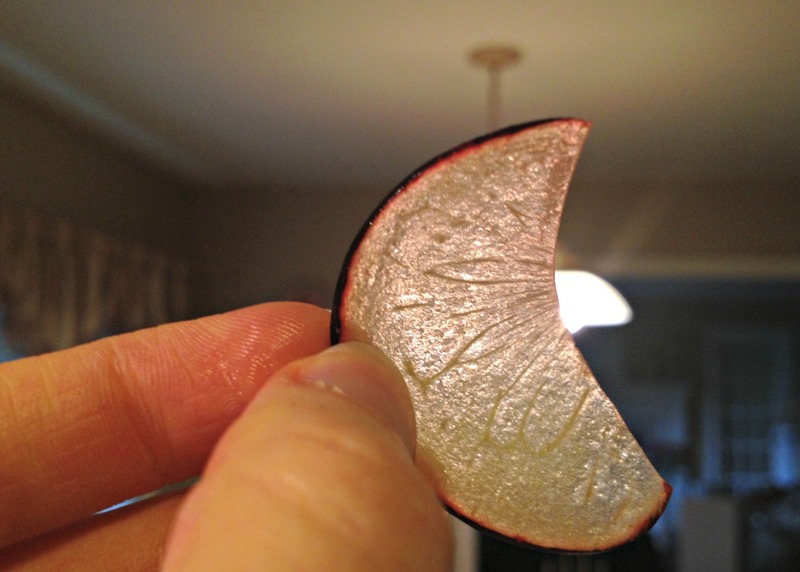 Face cut side of plum halves down and, lengthwise, make very thin slices. Place slices on paper towels as you go. 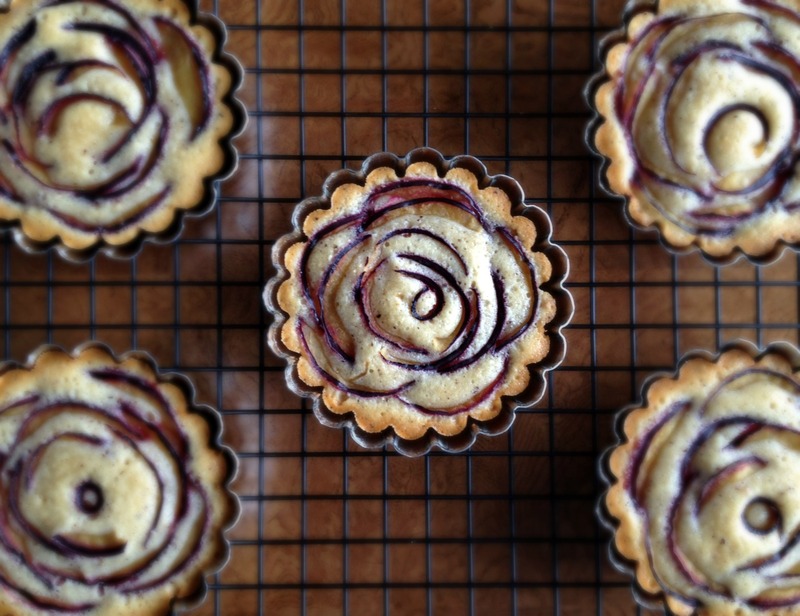 Arrange slices, curving and overlapping around the pans from the outside in to create a rose of sorts. (Do not overlap edge.) Make sure the skin side faces up and the plums do not sink all the way into the batter (it puffs when it bakes). Place molds on baking sheet and in oven and bake for 28-32 minutes, until edges are golden and the center that puffs up around the plums bounces back when pressed with finger. Remove from baking sheet and cool completely in pans on wire rack. Once cool, dust with confectioners’ sugar. For the perfect contrast of texture between the crisp edges and dense innards, serve within hours of baking. They will still be good and moist after 3 days at room temperature (or 5 days in the refrigerator), but they will be soft from center to edge. If you are plating them, I highly recommend serving them with whipped cream that has been spiked with brandy and toasted hazelnuts! *I like to use the remaining butter to grease the tart molds. **Don’t have tart molds? You can use this base financier batter to make the more common mini-muffin sized bites. Bake for around 12-15 minutes and keep an eye on them. Baking is such a fickle friend – most of the time it’s more fun than you can imagine, and so rewarding, but sometimes if it goes wrong it can completely change your mood. I’m glad you persevered and made these – they are absolutely beautiful. They are beautiful. I am a perfectionist too and used to be really hard on myself, but I’ve eased up over the years. Keep on taking more deep breaths. And baking :) Take care! And strangely I did not see any financiers up here on floor 4 1/2… hmm. Did you forget? :) They are absolutely gorgeous by the way! I actually wanted to bring them in; they’re pretty easy to transport. They just went too quickly! In a few weeks, I should be more able to bring in goodies :).